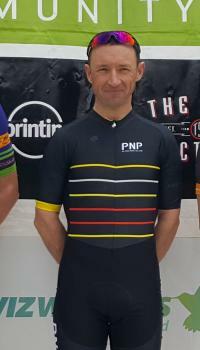 Wellington’s David Rowlands overcame strong cross winds and a challenging hilly course to win the elite grade of race four of the Trust House North Island Team Series held in Wairarapa on Saturday. Riding for the Phite-Breadcraft team in what was arguably the most challenging race of the series to date thanks to a series of hill climbs, including the final 3km slog up Rangitumau hill on the outskirts of Masterton, Rowlands attacked with 15km to go. “I was watching other riders trying to break away but the bunch chased then very quickly and I knew everything was coming down to the last 5km, so I decide to attack. When I went away I managed to get a lead of 30-40 seconds very quickly and over the last 3km up the hill my lead was over a minute so I knew it was on the bag. It was a great circuit, challenging,” Rowlands said. The first stage of the race was uneventful with most of the bunch together at the 60 km turn at Tirumea, but that all changed on the way back with the strong cross winds between Alfredton and Dryers Rock playing a big part in the final outcome. Many riders lost contact with the main bunch after 70km of racing and after climbing up Dryers Rock together and seeing some early attacks by a few riders that came to nothing, the leading riders controlled the race waiting for the big showdown up the finishing hill. Rowlands attacked with 5 km to go and finished 96 seconds in front of team mate Antony Nalder with Matt Webb-Smith from team Tank Guy/Bikebox come in third place. Young Manawatu rider Madi Hartley-Brown riding for the Tank Guy/Bikebox team come in sixth place taking the series lead in the elite and U23 sections. In the Mitre 10 Masterton Masters race, riders raced from Rangitumau to Alfredton via Mauriceville and Dryers Rock and return. 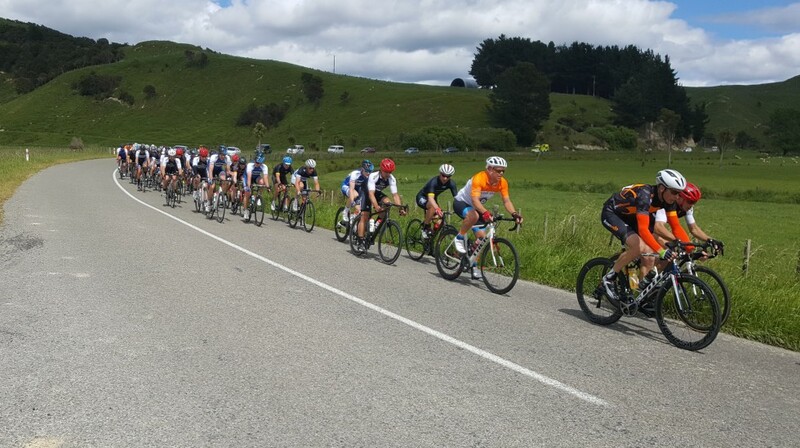 In the Masters One grade most of the 40 riders remained together at the bottom of the Dryers Rock hill, before Hawke’s Bay rider Gary Hall (Cycle Nation) and Matt Weaver (Rivet Racing) managed to break away from the bunch and maintained their position until the finish. They battled up the hill with Hall taking the victory by 11 seconds from Weaver while Masterton riders John Mudgway (Tararua Builders) came home in third, two minutes behind. In the Masters Two grade the race was exciting with the majority of the field close together at the bottom of Dryers Rock hill. A group of 10 riders broke away after the hill including race series leader Huib Buyck (Total Home Theatre), Gary Anderson (Velo Ronny’s) and Road Race & Individual Time Triallist at the 2017 World Masters Games in Auckland, Jim McMurray from Waikato. McMurray tried to get away with 6km to go but was chased by the remaining nine riders in the front group. He was back to the bunch one kilometre from the bottom of Rangitumau hill and from there it was every man for himself. They fought toe to toe over the last 2km of hill climbing with Wellington’s Rob Kilvington (PNP) taking the win by one second from Matthew Stevens (Kiwivelo) with Masterton’s Jeff Saywel (Tararua Racing) finishing in third, four seconds behind. Kilvington was one of many Wellington riders who come to Wairarapa last weekend to ride the circuit and the Rangitumau hill climb in preparation and it paid off on Saturday. Anderson (Velo Ronny’s) crossed the line in sixth place taking the lead with one race to go. In all grades, all winners of the Series will be decided in the final race on Sunday 3rd December. Race five will see with riders complete a 120km race from Masterton to Pahiatua and back.